The Creative Age: “Independence Day” From dream to reality - nature’s lesson of survival for our young to be that 1 in 1,000 sea turtle. 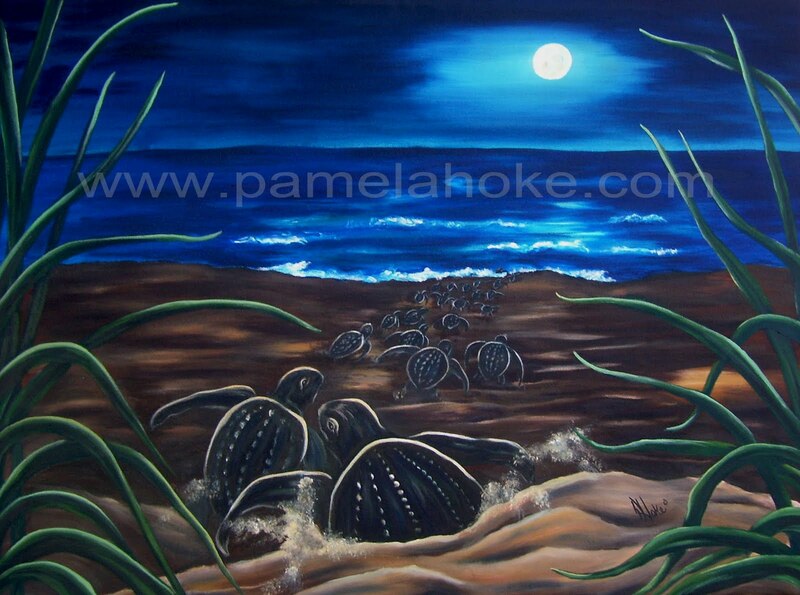 “Independence Day” From dream to reality - nature’s lesson of survival for our young to be that 1 in 1,000 sea turtle. July 3, 2010 - I woke up from a nap with the vision of the perfect view of a hatching of sea turtles. Dreams really are our windows to our future, at times serving as a foreshadow of what may come, or what we simply need to be prepared for. It is up to us to choose our best perception and path. I began to reluctantly get ready for a party to view fireworks north from an oceanfront condo, after my husband, Tim’s gentle nudging. He reminded me of our need to get out once in a while and make new friends. I switched my perception toward the positive, it was at an ocean-front condo after all, and we really did need a night out as a couple. Our son was soon to turn 18 this month, and it was affecting us both in strange ways. 7:00pm – As we arrive, we mesh right into the special gathering of friends at the condo. We were just north of Stuart Beach and the weather was beautiful, of course, slight overcast here and there. I just love living on the Treasure Coast of South Florida, truly the best of many worlds with its uniquely preserved natural environments to the cultural residents who are grateful to claim it as their home. As I took a romantic walk on the beach with Tim, I felt something was going to happen…but couldn’t quite pinpoint it. 9:30pm - We headed out with a group from the party to see if the fireworks up north were visible. Yet, suddenly, I looked to my right, and two lines of people were gathered just under the beachwalk…I knew immediately what was going on. I threw off my sandals and couldn’t get down the stairs to the beach fast enough. An estimated 30-50 baby sea turtles were making their way to the ocean from an unmarked nest, and even more amazing, they were unmistakably rare leatherback sea turtles! Why the heck do we need fireworks , that only waste our resources, when nature provides a spectacle such as this? From dream to reality, the painting in my mind literally came to life. The rush and the anticipation of cheering on each little hatchling in their struggle to get the ocean was incredible. I became flustered as the folks, not educated in how to deal with this situation, were taking flash photos like crazy – startling the poor little babes as they rely on the light from the moon to guide them to the sea in their first moments of life. Tim and I gently began to explain to these folks why they had to stop, and pointed to some of the little guys who were dazed and confused, some heading the wrong way, some frozen. Eventually most snapped back into their instincts and continued their long journey to the water. Watching those little flippers push to get out of the nest, and struggle over each massive footprint mound was exhilarating. Some were stunned by the brief camera flashes would just sit there until their sonar kicked back in and directed toward the surf, some flipped over on their backs while striving to clear what I am sure seemed like sand mountains to them. I couldn’t help but see the connection of childhood to adulthood as I thought of my first-born son turning 18 years old this month. I thought about how we all struggle through the difficulties of childhood, yet persist in the quest to get to the ocean (adulthood). Watching these guys struggle through the massive footprints left in the sand, only to hit the rough surf and topple over 2-3 times until they actually could cut through into the ocean , made me think hard about the difficult move into adulthood…the journey as a whole, and how building initial survival skills are vital. After the right of passage through childhood, the determination to break out into the ocean – to be “independent” –is strong, to receive the privilege, the “independence.” However, only then to face the barracuda’s, the sharks, and rough unforgiving ocean for the rest of their lives. (Did you know only about 1 in 999 makes it to adulthood? Talk about survival of the fittest). As the hatchlings reached the surf, my heartbeat rose as their little heads would raise in anticipation of getting that first taste of salty water. We found ourselves cheering them on, praying they could cut through that initial thrust of that first cool ocean wave. The frustration of watching some topple backwards, flip over multiple times as the surf became the largest wall to independence felt exactly like having to stay back and watch my son topple over as he learned the difficulties of life. The hatchlings have to get through the journey on their own if they are going to be that 1 in a 1,000 who makes it to adulthood. As human parents, the only way we can prepare our young is to guide them, just as the moonlight guides and the ocean calls to these hatchlings, so our young must have the life skills to be able to thrust themselves into that massive ocean of life, with the strength and skills from that journey across the beach, in the quest to become that 1 in 1,000 turtle, that 1 in 1,000 that shines in the world. Thanks for sharing this incredible moment and yet another precious life lesson from nature! The original and Limited Edition Giclee’s of “Independence Day” are currently available on my virtual store! (Only 50 Canvas Giclee's and only 100 Parchment paper Giclee's will be made) Please CLICK HERE to order yours to share in this experience today. I will be donating 20% of proceeds to The Blue Ocean Institute, driven to inspire a deeper connection with nature and enlighten us through “sea ethics.” Please visit this site and learn how you can take some small steps to helping preserve our most precious resource.